This is a list of some of the world's music genre and their definitions. African Folk - Music held to be typical of a nation or ethnic group, known to all segments of its society, and preserved usually by oral tradition. Afro jazz - Refers to jazz music which has been heavily influenced by African music. The music took elements of marabi, swing and American jazz and synthesized this into a unique fusion. The first band to really achieve this synthesis was the South African band Jazz Maniacs. Afro-beat - Is a combination of Yoruba music, jazz, Highlife, and funk rhythms, fused with African percussion and vocal styles, popularized in Africa in the 1970s. Afro-Pop - Afropop or Afro Pop is a term sometimes used to refer to contemporary African pop music. The term does not refer to a specific style or sound, but is used as a general term to describe African popular music. Apala - Originally derived from the Yoruba people of Nigeria. It is a percussion-based style that developed in the late 1930s, when it was used to wake worshippers after fasting during the Islamic holy month of Ramadan. Assiko - is a popular dance from the South of Cameroon. The band is usually based on a singer accompanied with a guitar, and a percussionnist playing the pulsating rhythm of Assiko with metal knives and forks on an empty bottle. Batuque - is a music and dance genre from Cape Verde. Bend Skin - is a kind of urban Cameroonian popular music. Kouchoum Mbada is the most well-known group associated with the genre. Benga - Is a musical genre of Kenyan popular music. It evolved between the late 1940s and late 1960s, in Kenya's capital city of Nairobi. Biguine - is a style of music that originated in Martinique in the 19th century. By combining the traditional bele music with the polka, the black musicians of Martinique created the biguine, which comprises three distinct styles, the biguine de salon, the biguine de bal and the biguines de rue. Bikutsi - is a musical genre from Cameroon. It developed from the traditional styles of the Beti, or Ewondo, people, who live around the city of Yaounde. Bongo Flava - it has a mix of rap, hip hop, and R&B for starters but these labels don't do it justice. It's rap, hip hop and R&B Tanzanian style: a big melting pot of tastes, history, culture and identity. Cadence - is a particular series of intervals or chords that ends a phrase, section, or piece of music. Calypso - is a style of Afro-Caribbean music which originated in Trinidad at about the start of the 20th century. The roots of the genre lay in the arrival of African slaves, who, not being allowed to speak with each other, communicated through song. Chaabi - is a popular music of Morocco, very similar to the Algerian Rai. Chimurenga - is a Zimbabwean popular music genre coined by and popularised by Thomas Mapfumo. Chimurenga is a Shona language word for struggle. Chouval Bwa - features percussion, bamboo flute, accordion, and wax-paper/comb-type kazoo. The music originated among rural Martinicans. Christian Rap - is a form of rap which uses Christian themes to express the songwriter's faith. Coladeira - is a form of music in Cape Verde. Its element ascends to funacola which is a mixture of funanáa and coladera. Famous coladera musicians includes Antoninho Travadinha. Contemporary Christian - is a genre of popular music which is lyrically focused on matters concerned with the Christian faith. Country - is a blend of popular musical forms originally found in the Southern United States and the Appalachian Mountains. It has roots in traditional folk music, Celtic music, blues, gospel music, hokum, and old-time music and evolved rapidly in the 1920s. Traditional Chinese music played by aging Naxi musicians. Photo taken in Lijiang, Yunnan province, China. Dance Hall - is a type of Jamaican popular music which developed in the late 1970s, with exponents such as Yellowman and Shabba Ranks. It is also known as bashment. The style is characterized by a deejay singing and toasting (or rapping) over raw and danceable music riddims. Disco - is a genre of dance-oriented pop music that was popularized in dance clubs in the mid-1970s. Folk - in the most basic sense of the term, is music by and for the common people. Freestyle - is a form of electronic music that is heavily influenced by Latin American culture. Fuji - is a popular Nigerian musical genre. It arose from the improvisation Ajisari/were music tradition, which is a kind of Muslim music performed to wake believers before dawn during the Ramadan fasting season. Funana - is a mixed Portuguese and African music and dance from Santiago, Cape Verde. It is said that the lower part of the body movement is African, and the upper part Portuguese. Funk - is an American musical style that originated in the mid- to late-1960s when African American musicians blended soul music, soul jazz and R&B into a rhythmic, danceable new form of music. Gangsta rap - is a subgenre of hip-hop music which developed during the late 1980s. 'Gangsta' is a variation on the spelling of 'gangster'. After the popularity of Dr. Dre's The Chronic in 1992, gangsta rap became the most commercially lucrative subgenre of hip-hop. Genge - is a genre of hip hop music that had its beginnings in Nairobi, Kenya. The name was coined and popularized by Kenyan rapper Nonini who started off at Calif Records. It is a style that incorporates hip hop, dancehall and traditional African music styles. It is commonly sung in Sheng(slung),Swahili or local dialects. Gnawa - is a mixture of African, Berber, and Arabic religious songs and rhythms. It combines music and acrobatic dancing. The music is both a prayer and a celebration of life. Gospel - is a musical genre characterized by dominant vocals (often with strong use of harmony) referencing lyrics of a religious nature, particularly Christian. Highlife - is a musical genre that originated in Ghana and spread to Sierra Leone and Nigeria in the 1920s and other West African countries. Hip-Hop - is a style of popular music, typically consisting of a rhythmic, rhyming vocal style called rapping (also known as emceeing) over backing beats and scratching performed on a turntable by a DJ. House - is a style of electronic dance music that was developed by dance club DJs in Chicago in the early to mid-1980s. House music is strongly influenced by elements of the late 1970s soul- and funk-infused dance music style of disco. Indie - is a term used to describe genres, scenes, subcultures, styles and other cultural attributes in music, characterized by their independence from major commercial record labels and their autonomous, do-it-yourself approach to recording and publishing. Instrumental - An instrumental is, in contrast to a song, a musical composition or recording without lyrics or any other sort of vocal music; all of the music is produced by musical instruments. Isicathamiya - is an a cappella singing style that originated from the South African Zulus. Jazz - is an original American musical art form which originated around the beginning of the 20th century in African American communities in the Southern United States out of a confluence of African and European music traditions. Jit - is a style of popular Zimbabwean dance music. It features a swift rhythm played on drums and accompanied by a guitar. Juju - is a style of Nigerian popular music, derived from traditional Yoruba percussion. It evolved in the 1920s in urban clubs across the countries. The first jùjú recordings were by Tunde King and Ojoge Daniel from the 1920s. Kizomba - is one of the most popular genres of dance and music from Angola. Sung generally in Portuguese, it is a genre of music with a romantic flow mixed with African rhythm. Kwaito - is a music genre that emerged in Johannesburg, South Africa in the early 1990s. It is based on house music beats, but typically at a slower tempo and containing melodic and percussive African samples which are looped, deep basslines and often vocals, generally male, shouted or chanted rather than sung or rapped. Kwela - is a happy, often pennywhistle based, street music from southern Africa with jazzy underpinnings. It evolved from the marabi sound and brought South African music to international prominence in the 1950s. Makossa - is a type of music which is most popular in urban areas in Cameroon. It is similar to soukous, except it includes strong bass rhythm and a prominent horn section. It originated from a type of Duala dance called kossa, with significant influences from jazz, ambasse bey, Latin music, highlife and rumba. Malouf - a kind of music imported to Tunisia from Andalusia after the Spanish conquest in the 15th century. Mapouka - also known under the name of Macouka, is a traditional dance from the south-east of the Ivory Coast in the area of Dabou, sometimes carried out during religious ceremonies. Maringa - is a West African musical genre. It evolved among the Kru people of Sierra Leone and Liberia, who used Portuguese guitars brought by sailors, combining local melodies and rhythms with Trinidadian calypso. Marrabenta - is a form of Mozambican dance music. It was developed in Maputo, the capital city of Mozambique, formerly Laurenco Marques. Mazurka - is a Polish folk dance in triple meter with a lively tempo, containing a heavy accent on the third or second beat. It is always found to have either a triplet, trill, dotted eighth note pair, or ordinary eighth note pair before two quarter notes. Mbalax - is the national popular dance music of Senegal. It is a fusion of popular dance musics from the West such as jazz, soul, Latin, and rock blended with sabar, the traditional drumming and dance music of Senegal. Mbaqanga - is a style of South African music with rural Zulu roots that continues to influence musicians worldwide today. The style was originated in the early 1960s. Morna - is a genre of Cape Verdean music, related to Portuguese fado, Brazilian modinha, Argentinian tango, and Angolan lament. Oldies - term commonly used to describe a radio format that usually concentrates on Top 40 music from the '50s, '60s and '70s. Oldies are typically from R&B, pop and rock music genres. Pop - is an ample and imprecise category of modern music not defined by artistic considerations but by its potential audience or prospective market. Quadrille - is a historic dance performed by four couples in a square formation, a precursor to traditional square dancing. It is also a style of music. R&B - is a popular music genre combining jazz, gospel, and blues influences, first performed by African American artists. Rai - is a form of folk music, originated in Oran, Algeria from Bedouin shepherds, mixed with Spanish, French, African and Arabic musical forms, which dates back to the 1930s and has been primarily evolved by women in the culture. Ragga - is a sub-genre of dancehall music or reggae, in which the instrumentation primarily consists of electronic music; sampling often serves a prominent role in raggamuffin music as well. Rap - is the rhythmic singing delivery of rhymes and wordplay, one of the elements of hip hop music and culture. Rara - is a form of festival music used for street processions, typically during Easter Week. Reggae - is a music genre first developed in Jamaica in the late 1960s. A particular music style that originated following on the development of ska and rocksteady. Reggae is based on a rhythm style characterized by regular chops on the off-beat, known as the skank. Reggaeton - is a form of urban music which became popular with Latin American youth during the early 1990s. Originating in Panama, Reggaeton blends Jamaican music influences of reggae and dancehall with those of Latin America, such as bomba, plena, merengue, and bachata as well as that of hip hop and Electronica. Rock - is a form of popular music with a prominent vocal melody accompanied by guitar, drums, and bass. Many styles of rock music also use keyboard instruments such as organ, piano, synthesizers. Rumba - is a family of music rhythms and dance styles that originated in Africa and were introduced to Cuba and the New World by African slaves. Salegy - is a popular type of Afropop styles exported from Madagascar. This Sub-Saharan African folk music dance originated with the Malagasy language of Madagascar, Southern Africa. Salsa - is a diverse and predominantly Spanish Caribbean genre that is popular across Latin America and among Latinos abroad. Samba - is one of the most popular forms of music in Brazil. It is widely viewed as Brazil's national musical style. Sega - is an evolved combination of traditional Music of Seychelles,Mauritian and Réunionnais music with European dance music like polka and quadrilles. Seggae - is a music genre invented in the mid 1980s by the Mauritian Rasta singer, Joseph Reginald Topize who was sometimes known as Kaya, after a song title by Bob Marley. Seggae is a fusion of sega from the island country, Mauritius, and reggae. Semba - is a traditional type of music from the Southern-African country of Angola. Semba is the predecessor to a variety of music styles originated from Africa, of which three of the most famous are Samba (from Brazil), Kizomba (Angolan style of music derived directly from Zouk music) and Kuduro (or Kuduru, energetic, fast-paced Angolan Techno music, so to speak). Shona Music - is the music of the Shona people of Zimbabwe. There are several different types of traditional Shona music including mbira, singing, hosho and drumming. Very often, this music will be accompanied by dancing, and participation by the audience. Ska - is a music genre that originated in Jamaica in the late 1950s and was a precursor to rocksteady and reggae. Ska combined elements of Caribbean mento and calypso with American jazz and rhythm and blues. Slow Jam - is typically a song with an R&B-influenced melody. Slow jams are commonly R&B ballads or just downtempo songs. The term is most commonly reserved for soft-sounding songs with heavily emotional or romantic lyrical content. Soca - is a form of dance music that originated in Trinidad from calypso. It combines the melodic lilting sound of calypso with insistent (usually electronic in recent music) percussion. Soukous - is a musical genre that originated in the two neighbouring countries of Belgian Congo and French Congo during the 1930s and early 1940s, and which has gained popularity throughout Africa. Soul - is a music genre that combines rhythm and blues and gospel music, originating in the United States. Taarab - is a music genre popular in Tanzania. It is influenced by music from the cultures with a historical presence in East Africa, including music from East Asia, Sub-Saharan Africa, North Africa, the Middle East and Europe. Taarab rose to prominence in 1928 with the rise of the genre's first star, Siti binti Saad. Tango - is a style of music that originated among European immigrant populations of Argentina and Uruguay. It is traditionally played by a sextet, known as the orquesta típica, which includes two violins, piano, doublebass, and two bandoneons. Waka - is a popular Islamic-oriented Yoruba musical genre. It was pioneered and made popular by Alhaja Batile Alake from Ijebu, who took the genre into the mainstream Nigerian music by playing it at concerts and parties; also, she was the first waka singer to record an album. Wassoulou - is a genre of West African popular music, named after the region of Wassoulou. It is performed mostly by women, using lyrics that address women's issues regarding childbearing, fertility and polygamy. Ziglibithy - is a style of Ivorian popular music that developed in the 1970s. It was the first major genre of music from the Ivory Coast. The first major pioneer of the style was Ernesto Djedje. Zouglou - is a dance oriented style of music from the Côte d'Ivoire (Ivory Coast) that first evolved in the 1990s. It started with students (les parents du Campus) from the University of Abidjan. Zouk - is a style of rhythmic music originating from the French islands of Guadeloupe and Martinique. It has its roots in kompa music from Haiti, cadence music from Dominica, as popularised by Grammacks and Exile One. Originally, Inuit throat singing was a form of entertainment among Inuit women while the men were away on hunting trips. It was an activity that was primarily done by Inuit women although there have been some men doing it as well. In the Inuit language Inuktitut, throat singing is called katajjaq, pirkusirtuk or nipaquhiit depending on the Canadian Arctic region. It was regarded more as a type of vocal or breathing game in the Inuit culture rather than a form of music. Inuit throat singing is generally done by two individuals but can involve four or more people together as well. In Inuit throat singing, two Inuit women would face each other either standing or be crouching down while holding each other's arms. One would lead with short deep rhythmic sounds while the other would respond. The leader would repeat sounds with short gaps in between. The follower would fill in these gaps with her own rhythmic sounds. Sometimes both Inuit women would be doing a dance like movement like rocking from left to right while throat singing. Sounds produced can be voiced or unvoiced and produced by inhalation or exhalation. Both Inuktitut words and meaningless syllables are used in Inuit throat singing songs. However, when words are used in throat singing, no particular meaning is placed on them for a song. When meaningless syllables are used, they are often portrayals of sounds the Inuit hear in their natural environments such as animal sounds or even water running down a creek. Popular Inuit throat singing songs are usually identified by the first word or sound that is produced in each song. Inuit throat singing is a skill that has to be taught and developed. Inuit throat singers try to show their vocal abilities in a fun competitive manner and the first one to either run out of breath, stop or laugh is declared the loser of the game. Each game usually lasts from one to three minutes. In a group of Inuit women, the overall winner is the one who beats the largest number of her competitors in this fun-filled activity. Unfortunately, there is no written record of when the Inuit first developed their form of throat singing which differs from the type found in Mongolia and other parts of the world that has some form of throat singing. The Inuit did not keep any written records and history was simply passed down from generation to generation orally. It was reported that at one point in time, Inuit women would actually have their lips almost touching while using each other's mouth cavity as a sound resonator. This technique is not used anymore. Inuit throat singing was actually forbidden by Christian priests for almost 100 years but since this religious ban was lifted, there has been a resurfacing of this traditional activity in the Inuit communities during the last 20 to 30 years. Interestingly enough, there has been a lot of interest among the younger Inuit generations in this revival in addition to the Inuit elders who are trying to bring throat singing back as part of present Inuit culture. Many of the young Inuit women who have taken up throat singing claim that it is a way for them to express their Inuit identities in the modern world where many Inuit traditions have already been lost. The revival of Inuit throat singing has been so popular that in September of 2001, the first throat singing conference was held in Puvernituk, Nunavik where different types of Inuit throat singing from different Arctic regions of Canada were demonstrated and shared. There has even been a small number of Inuit throat singing CDs produced. Reggaeton is a type of urban music that has become widespread in popularity among young music lovers in Latin America, North America, Europe, Asia, and Australia. Reggaeton music originated in Panama and caters to Hispanic youth, with rapping and singing often in Spanish. The music is a blend of Jamaican style music such as dancehall and reggae and Latin America style music such as salsa, bomba, plena, merengue, bachata, hip hop, bolero, R&B, and Latin pop. Reggaeton music boasts its own specific rhythm and beat. The rhythm of reggaeton is often referred to as "Dem Bow." The name Dem Bow references the title of a dancehall song from the 1990s by Shabba Ranks. Though the music genre of reggaeton is mostly associated with Puerto Rico (where this style of music was popularized and became famous), the lyrics are more hip-hop type lyrics than dancehall. It's the reggaeton beat, or Dem Bow, that drives the music and dances. The beat is described as a drum-machine track that originated with Jamaican dancehall rhythm. Reggaeton combines a syncopated snare and steady kick drum to create an unusual rhythm. There's a 4/4 beat emphasized by the kick drum, and the snare starts with the "and" of the 3rd 8th note and right on the 4th 8th note. There are about 95 beats per minute, and the result is a magnified "boom-ch-boom-chick" sounding beat. Reggaeton beat sounds are usually synthesized electronically. There are also simple melodies created with electronic instruments, keyboards, and electric guitars. The beats are versatile and can be based on the bolero, hip-hop, salsa, merengue, bachata, or other similar beats. Sensual (and controversial) dancing can often be seen in reggaeton clubs or on music videos. The perreo type dance is a form of grinding dance derived from Puerto Rico. The dance puts women in control of the dance and is very provocative in its nature. Perreo moves are popular in dancehall, rhythm and blues, and hip-hop music as well. A slightly calmer form of reggaeton dancing is cumbia, which was originally a folk dance and music from Colombia. Like perreo, the cumbia dance is flirtatious in nature with the women luring the men toward them and then pushing them away. Some of the leading artists in reggaeton include CandyMan, Esko, Fito Blanko, Nicky Jam, La Fabrica, Don Miguelo, Daddy Yankee, De la Ghetto, DJ Blass, Baby Rasta & Gringo, Don Chezina, Lito & Polaco, Eddie Dee, Adassa, El Chombo, and Tony Touch. Some popular producers of reggaeton music are Eliel, Luny Tunes, and Noriega. With the widespread popularity of reggaeton music, there are now many radio stations specializing in this type of music. There are also online radio venues where fans can download music, listen online, or watch the reggaeton music video of choice. The major benefit of online radio is fans can listen to their favorite music or watch their favorite videos around the clock. The Tin Whistl e (sometimes called a pennywhistle ) is a simple and cheap instrument. It's simply a metal tube with six fingerholes and a mouthpiece (much like a recorder); it has a range of about two octaves. Costs range from a few dollars to a few hundred dollars -- although some of the best players play only the cheaper brands. 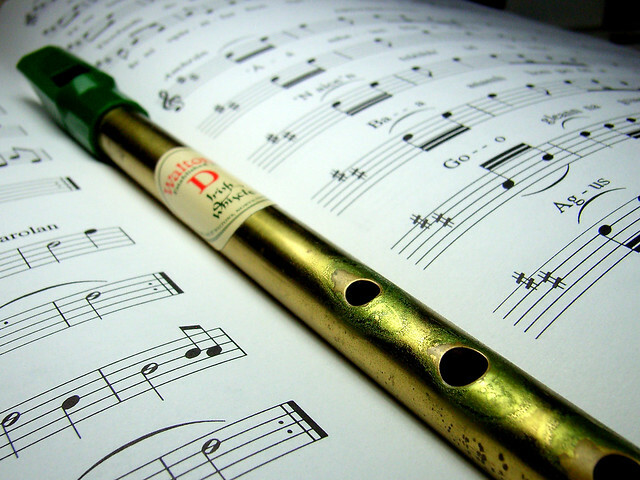 The tin whistle is a simple instrument -- and it's simple to play, and simple to play easy tunes. But -- it's not simple to master! The instrument may be cheap, but you'll have to pay for mastery ... by practicing! The haunting whistle tunes from the movie "Titanic" illustrate the deep soul found in this instrument. This instrument is commonly made from metal (usually brass) with a molded whistle mouthpiece. By playing it open (not covering any of the six fingerholes), then by covering each fingerhole in turn, you can play the 7 notes in a diatonic (a simple Do-Re-Mi scale -- essentially the white keys on a piano) scale. Blow a little bit harder and you'll play the same note, but an octave higher. While it is a diatonic instrument, you can achieve sharps and flats by half-covering fingerholes. Since there are essentially only two open notes -- a note, then the note an octave higher when you blow harder -- each tin whistle is said to represent a certain Key signature. For instance, if the open note sounds a "D", then the whistle is considered to be in the key of D. Many players carry a small set of whistles in the most commonly used keys. Some people don't realize you can actually tune a tin whistle! You do so by sliding the metal barrel of the whistle in and out of the mouthpiece head. Some whistles have the head glues securely to the barrel. You can usually loosen the glue by holding the joined portion under hot running water. Don't use boiling water -- this may melt the plastic whistle head! Key signatures commonly found in Celtic Music are "D Major" and "G Major". By default, all tin whistles are in a Major key (since they play a diatonic scale). However, if you begin your scale with all the fingerholes covered (instead of all fingerholes open), then you're beginning one step higher than a diatonic scale -- which results in a minor key signature! For instance, a tin whistle in "D" can play in E Minor if you begin your scale by covering all the fingerholes. Interestingly enough, the chord sequence "E Minor" and "D Major" is commonly found in Celtic Music. (This is the same chord sequence used in "What Would You Do with A Drunken Sailor".) A whistle in "G Major" could easily play in A Minor (A Minor and G being another commonly found chord sequence). Joey Robichaux operates Celtic Sheet Music at http://www.celtic-sheet-music.com where whistle players can freely download over 3,000 Celtic fiddle tunes! country music artists during the 1970s. Country music has many new artists but also plenty of older ones that still hold the world in awe. Country music oldies still pull at the heart strings of people and take them back to earlier times. There are many great songs out there that have stood the test of time. They have continued to reach out to old and new audiences for decades. These types of country music oldies can really help to bridge the generation gap that seems to always be a barrier in our society. Just about everyone knows the words to I Fall to Pieces by Patsy Cline. It is a song that we can all relate to as we have all suffered from a broken heart. This is the top country music oldie by female artists that have ever been recorded. Next is Coal Miners Daughter from Loretta Lynn. The story tells about her life growing up poor but also growing up with plenty of love. George Jones has a country music oldie with the tune He Stopped Loving Her Today. It tells the story of a man that loved a woman so much he continued to do so until the day he died. It is a very touching love song that can still bring a tear to my eye when I hear it. Johnny Cash has many great songs that people remember. Two that are oldies people always listen to are I Walk the Line and Ring of Fire. If you haven’t taken the time to listen to some country music oldies for a while, you should. It can lift your spirits and take you back to some fond memories of your past. The songs may take on a new meaning from what they once did long ago. You can find complete CDs of country music oldies for your home and your car. You can also download your favorite songs onto your iPod. If you have satellite radio, you will be happy to know they dedicate a few channels to country music oldies as well. Much regular radio station understands how many people still yearn for the oldies to be played. They may throw a few into the mix for their listeners on a regular basis. Some of them also have blocks of time dedicated to oldies as well. It is a term coined to denote both traditional as well as contemporary music. The traditional music has been a part of the village life as well as its contemporary forms. All come under the purview of the folk music or the "roots music as it is otherwise known. The composers, lyricist and the artists are all unknown as the entire village or town folks gather to play this genre of music to pass their time as well as the age old tradition of singing the songs passed on to them. Therefore, there is no particular person but an entire society which is responsible for this kind of music. - It is not time or era specific, rather it is culture specific. Different kind of folk has come up owing to the natural geography of the area and the prevalent customs. - It is passed on the coming generations as a 'word of mouth' instead of being handwritten or via any other media. It is only off late that the technology has enabled us to do so and preserve the culture in various ways. - This kind of music is a natural way of cohesion among various ethnic groups. In fact, this is how one gets to see variation in the folk music. Today, contemporary music is a unique blend of all the cultures and places that it has traveled. - This genre of music is not anybody's intellectual property. Therefore, there is no copyright. In fact, more than an individual, it belongs to the entire society. - This kind of music predominantly celebrates the life and its various forms. One can get to hear songs for birth, death, marriage, harvest and other daily or routine activities of life. - The lyrics are extremely meaningful as they are mostly about life faced by the people. Today, the term folk music has acquired a different term altogether in its contemporary form. It is no longer the narrative verses of people and their activities anymore such as hymns, religious music, Gregorian chants, instrumental music, dance music etc. The contemporary form of this genre is a little vague. This period in time especially the 1960s where the contemporary form reached the peak is known as the 'folk revival' period. Enjoy listening to Folk Music from singer songwriters and find songs and music videos you like. http://www.singersongwriter.com Check out some new original folk artists.